Is the selective system preferable to the comprehensive system? Today we talked about different school systems. Especially the question “Is the selective system preferable to the comprehensive system?” is quite interesting for me. Since I spent my schooldays in a comprehensive school, I was always confronted with people backbiting about this educational system. I wouldn’t say that the comprehensive system is better than the selective one in any case, but there are definitely some advantages. For example the fact that the pupils are not separated at the age of eleven, which – in my eyes – is far too young to decide whether a student is capable of passing the Abitur or not. On the other side one could argue that at a comprehensive school ungifted learners may constrain the smart fellows. Nevertheless, I am deeply grateful that I had such wonderful schooldays and I believe in comparison with the quality of teaching the kind of school system is rather unimportant. After the lessons Leonie, Philo and I went to a supermarket to find the ingredients we needed in order to bake a cheesecake. We couldn´t find all of them so we spontaneously decided to try another one (some sort of cherry pie). It took us more than three hours. 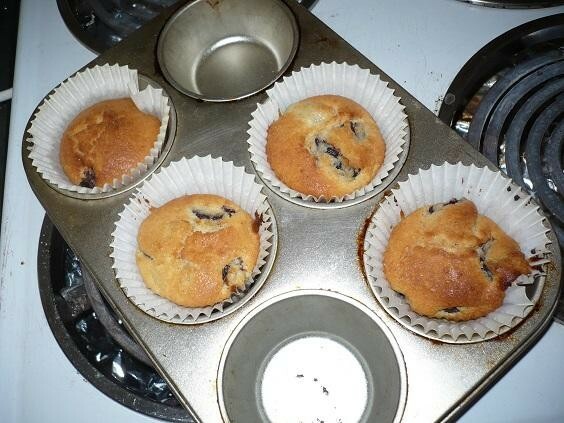 However, we eventually managed to finish the cake as well as some muffins. I do not cook or bake often, but when I do it, I am always terribly proud of myself. This is why I can´t resist to show you a picture of what we´ve done :-). In the evening there was a small party at the school. Unfortunately it was very crowded… but since my place was right in front of the buffet, it didn´t bother me so much.